On 9 October 1992, the United Nations Security Council passed Resolution 781, prohibiting unauthorized military flights in Bosnian airspace. This resolution led to Operation Sky Monitor, where NATO monitored violations of the no-fly zone, but it did not take action against violators of the resolution. On 31 March 1993, in response to 500 documented violations, the United Nations Security Council passed Resolution 816, which authorized states to use measures "to ensure compliance" with the no-fly zone over Bosnia. In response, on 12 April, NATO initiated Operation Deny Flight, which was tasked with enforcing the no-fly zone and allowed to engage the violators of the no-fly zone. However, Serb forces on the ground continued to attack UN "safe areas" in Bosnia, and the UN peacekeepers were unable to fight back as the mandate did not give them authority to do so. On 4 June, the United Nations Security Council passed Resolution 836 authorizing the use of force by UNPROFOR in the protection of specially designated safe zones. Operation Sharp Guard, a naval blockade in the Adriatic Sea by NATO and the Western European Union, was approved at a joint session of NATO and the WEU on 8 June and began on 15 June. On 12 March, the United Nations Protection Force (UNPROFOR) made its first request for NATO air support, but close air support was not deployed, owing to a number of delays associated with the approval process. On 10 and 11 April 1994, UNPROFOR called in air strikes to protect the Goražde safe area, resulting in the bombing of a Bosnian Serb military command outpost near Goražde by two U.S. F-16 jets. This was the first time in NATO's history it had ever attacked ground targets with aircraft. Subsequently, the Bosnian Serbs took 150 UN personnel hostage on 14 April. On 16 April, a British Sea Harrier was shot down over Goražde by Bosnian Serb forces. Around 29 April, a Danish contingent (Nordbat 2) on peacekeeping duty in Bosnia, as part of UNPROFOR's Nordic battalion located in Tuzla, was ambushed when trying to relieve a Swedish observation post (Tango 2) that was under heavy artillery fire by the Bosnian Serb Šekovići brigade at the village of Kalesija, but the ambush was dispersed when the UN forces retaliated with heavy fire in what would be known as Operation Bøllebank. On 5 August, at the request of the UNPROFOR, two U.S. A-10 Thunderbolts located and strafed a Bosnian Serb anti-tank vehicle near Sarajevo after the Serbs tested NATO's resolve by seizing weapons that had been impounded by UN troops and attacking a UN helicopter. Afterwards, the Serbs agreed to return the remaining heavy weapons. 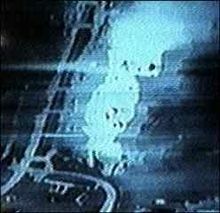 On 22 September 1994, NATO aircraft carried out an air strike against a Bosnian Serb tank at the request of UNPROFOR. On 25–26 May 1995, after violations of the exclusion zones and the shelling of safe areas, NATO aircraft carried out airstrikes against Bosnian Serb ammunition depots in Pale. In retaliation, the Bosnian Serbs took 370 UN peacekeepers in Bosnia hostage and subsequently used them as human shields at potential targets in a successful bid to prevent further air strikes. On 2 June, two U.S. Air Force F-16 jets were sent on patrol over Bosnia in support of Operation Deny Flight. While on patrol, an F-16 piloted by Captain Scott O'Grady was shot down by a Bosnian Serb SA-6 surface-to-air missile. O'Grady was forced to eject from the aircraft. Six days later, he was rescued by U.S. Marines of the 24th Marine Expeditionary Unit from USS Kearsarge. The event would come to be known as the Mrkonjić Grad incident. On 11 July, NATO aircraft attacked targets in the Srebrenica area of Bosnia and Herzegovina as identified by and under the control of the United Nations. This was in response to Bosnian Serb forces advancing on the UN-declared Safe Area of Srebrenica. Bosnian Serb warlord Ratko Mladić threatened to kill 50 UN peacekeepers who were seized as hostages and also threatened to shell the Muslim population in Srebrenica if NATO air strikes continued. The UN peacekeepers called off the air strikes and agreed to withdraw from Srebrenica as the Bosnian Serbs promised they would take care of the Muslim population for the peacekeepers to spare their own lives. For two weeks, VRS forces under Mladić killed over 8,000 Bosniaks, mainly men and boys, in the Srebrenica massacre, which remains the worst act of genocide in Europe since World War II. On 25 July, the North Atlantic Council authorized military planning aimed at deterring an attack on the safe area of Goražde, and threatened the use of NATO air power if this safe area was threatened or attacked. On 1 August, the Council took similar decisions aimed at deterring attacks on the safe areas of Sarajevo, Bihać, and Tuzla. On 4 August, NATO aircraft conducted air strikes against Croat Serb air defense radars near Udbina airfield and Knin in Croatia. On 10 August, the Commanders of Allied Forces Southern Europe (CINCSOUTH) and UNPROFOR concluded a memorandum of understanding on the execution of airstrikes. The two French airmen who were captured after their Mirage 2000N was downed by Bosnian Serb forces on 30 August 1995, Lt. Jose Souvignet and Capt. Frederic Chiffot, were released only upon the end of the Bosnian War, on 12 December 1995. Upon being released, they told reporters that they had been treated well while in captivity. ^ "US interventions post-Cold War: Bosnian War". Al Jazeera. 5 September 2013. Retrieved 12 August 2014. ^ Ripley, Tim (1999). Operation Deliberate Force: The UN and NATO Campaign in Bosnia, 1995. Lancaster, England: Centre for Defence and International Security Studies. p. 316. ISBN 978-0-9536650-0-6. ^ Holbrooke, Richard (1999). To End a War. New York: Modern Library. p. 327. ISBN 0-375-75360-5. OCLC 40545454. ^ a b c d e Bethlehem, Daniel L.; Weller, Marc (1997). The 'Yugoslav' Crisis in International Law. Cambridge International Documents Series. 5. Cambridge University Press. p. liii. ISBN 978-0-521-46304-1. ^ Carnes, Mark Christopher (2005). American national biography. 29. Oxford University Press. p. 29. ^ a b c Bethlehem, Daniel L.; Weller, Marc (1997). The 'Yugoslav' Crisis in International Law. Cambridge International Documents Series. 5. Cambridge University Press. p. liiv. ISBN 978-0-521-46304-1. ^ Hansen, Ole Kjeld (1997). "Operation "Hooligan-bashing" – Danish Tanks at War". Archived from the original on February 21, 2014. Retrieved 29 January 2015. ^ "NATO AIRCRAFT ATTACK BOSNIAN-SERB TANK" (Press release). NATO. 22 September 1994. ^ "NATO AIRCRAFT PROVIDE CLOSE AIR SUPPORT IN THE SREBRENICA AREA" (Press release) (in English and French). NATO. 11 July 1995. ^ a b Gazzini, Tarcisio (2005). The changing rules on the use of force in international law. Manchester University Press. p. 69. ISBN 978-0-7190-7325-0. ^ Mahnken, Thomas G. (2010). Technology and the American Way of War Since 1945. New York: Columbia University Press. p. 182. ISBN 978-0-231-12337-2. ^ a b John A. Tirpak (October 1997). "Deliberate Force". Air Force Magazine. Retrieved 13 July 2013. ^ Brawley, Mark R. (2005). Globalization, Security, And The Nation-State: Paradigms In Transition. State University of New York Press. p. 74. ISBN 978-0-7914-8348-0. ^ Holbrooke, Richard (1999). To End a War. New York: Modern Library. p. 102. ISBN 0-375-75360-5. OCLC 40545454. ^ Scott Kraft and Dean E. Murphy (13 December 1995). "Bosnian Serbs Free Downed French Airmen". California: Los Angeles Times. Retrieved 7 December 2012. ^ Tom Hundley (13 December 1995). "2 Downed French Airmen Act Removes Possible Hitch In Signing Of Peace Agreement". The Chicago Tribune. Retrieved 7 December 2012. ^ Robert C. Owen (January 2000). "Deliberate Force A Case Study in Effective Air Campaigning. Final Report of the Air University Balkans Air Campaign Study" (PDF). Air University Press. p. 522. ^ Robert C. Owen (30 September 2011). "Operation Deliberate Force: A case study in humanitarian constrains in aerospace warfare" (PDF). Harvard Kennedy School. p. 63.